We love how our community of Yogis always sharing their experiences, we want to encourage everyone to do Yoga because it is for everyone and it can be done anywhere. Here is Debbie’s experience with Online Yoga. How did you get into Online Yoga? I had taken several of Debra’s yoga classes when she was at a local yoga studio. When she started the on-line yoga classes, I joined in. What is your personal opinion about Online Yoga? I love the flexibility on-line yoga gives me. I’m not tied to a class schedule and I can do it anywhere. I can do yoga outside on my deck when the weather is nice or inside when it’s not. I can do a quick yoga session at my desk in the middle of the day to loosen up or a quick session in the evening to relax. I often invite my daughters to join me on-line, so that we can do yoga together “virtually”, even though we live miles apart. Absolutely! There are so many variations of yoga, you can get whatever you’re looking for, strength, flexibility, cardio or a combination of all three. I always feel great after some time on my mat, both physically and mentally. Do you see any difference between online and studio Yoga? The big difference is the number of people around you. You can be totally by yourself if you want or if you need people, you can invite your family and friends to join in with you. Would you like to give any advice for all the people that doesn't feel confident or flexible enough to start doing Online Yoga? If you can breathe, you can do yoga. Since movement is tied to breath, you don’t need to know much more than that. 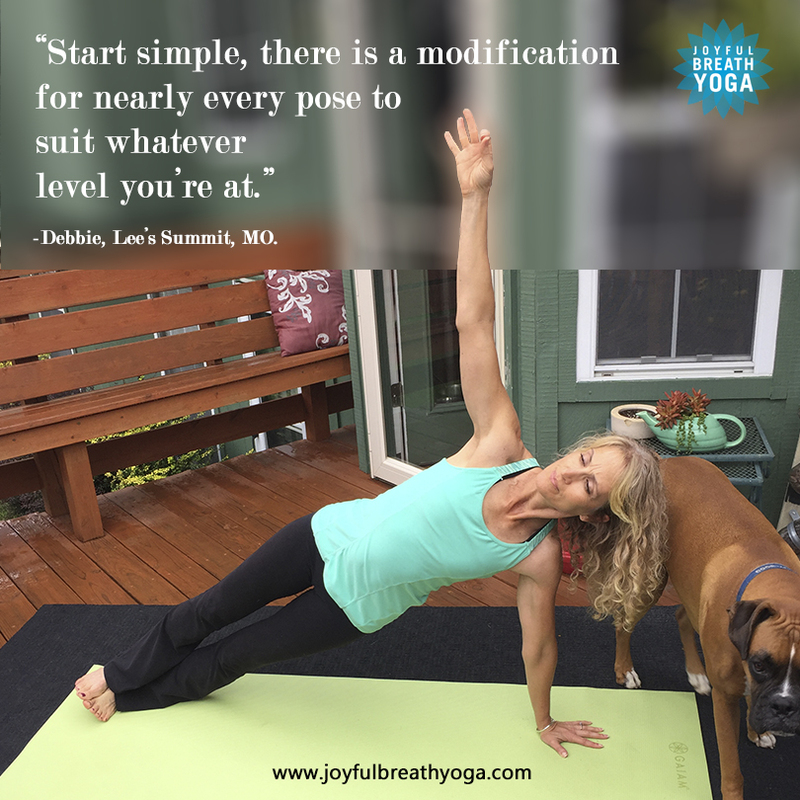 Start simple, there is a modification for nearly every pose to suit whatever level you’re at.